In what fellow FASS member Mark Jackson-Brown charmingly refers to as “the Before Times1”, book distribution in Ontario was pretty patchy and while I remember that word of mouth on rec.arts.sf-lovers was very positive about The Steerswoman, I didn’t manage to find a copy of it for my own until 1993, four years after it was published. I can tell this because when I look at the back of my copy it has a sticker from A Second Look Books dated 1993. Which I guess means the author didn’t make any money off me so let’s move quickly on to the next paragraph. Both the original Hescox cover (which I will get back to) and the current cover involve maps and that’s significant. 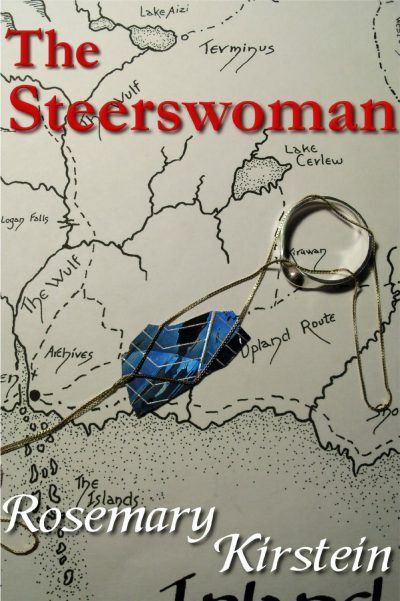 Rowan, the protagonist, is a Steerwoman; the steerswomen seem to have begun as navigators but they’ve expanded past that into gathering and cataloging all of the knowledge they can, and beyond that to trying to arrive at coherent explanations for what they see around them. They are this world’s scientists, sharing information freely on the condition that people share information with them freely; anyone who lies to a Steerswoman or refuses to answer a question finds themselves under the Ban, unable to query any Steerswoman. The text itself begins like a thousand fantasy stories (and even more fantasy role playing campaigns), with the two lead characters meeting in a tavern somewhere on the road to adventure. On the one hand, we have the lead, Rowan the Steerswoman, on the trail of information and on the other Bel the Outskirter, a woman from a culture of herders and raiders on the edge of the inhabited territories. The two soon agree to become companions, Rowan’s civilized skills complimented by Bel’s somewhat less civilized skills. The plot takes a turn when Rowan is ambushed on the road out of town. It is very likely that if she had not been in Bel’s company she’d be dead. As it is she’s now aware that someone wants her dead and it’s not that hard to work out that the person responsible is almost certain a wizard, masters of magic who stand on contrast to the Steerswomen: where the Steerswoman share information freely, the wizards hoard theirs, and where the Steerswomen get by on persuasion, the wizards enjoy lofty positions of power because they are in the habit of killing people who try to say no to them (and often, those who say yes because wizards don’t really care about collateral damage). As Rowan points out, she is in no way an unusual Steerswoman so it is not hard to deduce that the issue must be not who she is but what she is doing and the only thing she’s doing is to research the gems. For some reason, this is a question the wizards or at least one persuasive wizard does not want answered and the fact that he or she is willing to kill a Steerwoman over it means the long period of tolerated indifference between wizards and Steerwomen may be ending, and the wizards have all the magical weapons. The cover of my first edition mass market paperback is by Richard Hescox, and at first glance it looks very much like a standard fantasy novel cover of the era; two people in faux-mediaeval clothes, conversing over a map in a room that could be a wizard’s or an alchemist’s laboratory, if not for the anachronistically advanced looking orrery to the right and the flat screen visible to the left. This mix of signals foreshadows the contents of the book (as does the fact Del Rey stuck a little “SF” in the colophon rather than fantasy) and the way in which it delivers some diamond hard science fiction wrapped in fantasy tropes. I expect the question of how to market this book was a vexing one, because part of the fun is working out what’s going on but on the other hand someone expecting a pure quill fantasy might react badly if they discover they’ve picked up an SF novel by mistake. One of the impressive things about this book and the series in general is the way Kirstein resists having Rowan deduce too much too quickly; she’s smart, she’s good at working out how things behave but there are many moments where the reader will work out what is going on and Rowan will not, because Rowan’s context denies her information about phenomena like electricity or gunpowder. As I’ve mentioned, this book and the rest of the series were very favourably reviewed online in the Before Time. Even now, of the 21 reviews on Amazon 17 are five star and three are four star. Jo Walton reviewed the whole series on tor.com in 2008; the comments were almost uniformly positive save for dissatisfaction with the lack of availability at the time and the slow pace of publication. 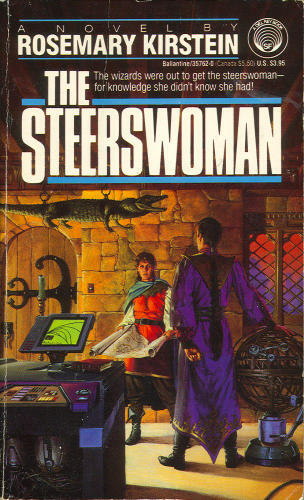 Despite that, I believe if you were to grab a passing SF reader and question them according to the customs of their people2, they would admit to having never heard of The Steerswoman books. It’s irritating that fame depends so much on dumb luck; there are much worse novels that have enjoyed greater, more sustained fame. The author’s site is here. In a glorious celebration of my venerable age, some members of the rest of the cast and crew have spoken openly about holding up “I wasn’t born yet” signs during my many informative anecdotes. Speaking of “according to the customs of their people”, I was not thrilled to discover there’s a scene in which Bel tortures a prisoner for information. In her defense, she’s a murderous thug who leaves a trail of bodies behind her. Rowan doesn’t help, exactly, but she also does not put up a spirited case against torturing the guy.